I'll be at Toy Fair next week helping Bigshot Toyworks in the Creator Studio space between the escalators leading down to the lower show floor. This is immediately outside the floor where the Diamond booth is located. And it also happens to be the other half of the space occupied annually by my buddy Argonaut Resins. Will be a good time. Klim and I will be talking toys and showing off the Bigshot Toyworks design studio capabilities. If you're attending, please swing by! It's literally impossible to miss us. 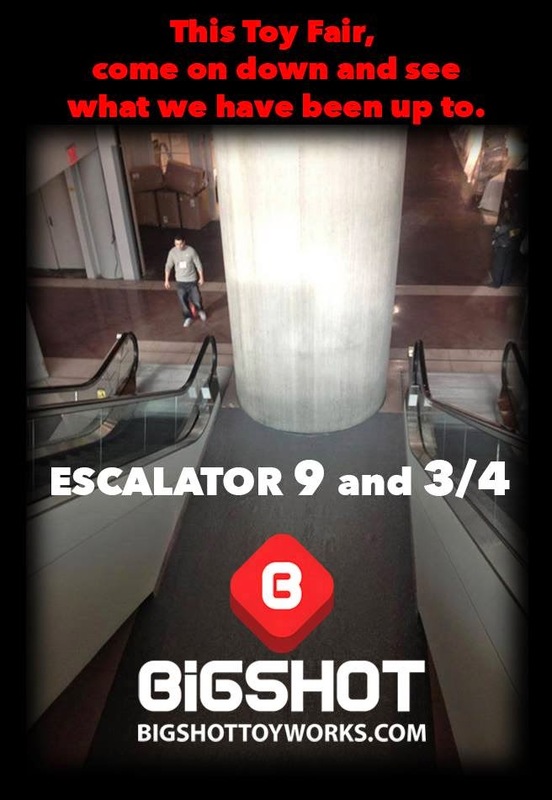 As you ride down the escalators, you will be staring at our space. It will be full of All City Style trains, Maddies, Four Horsies and all sorts of other Bigshot goodness. Hey Toy, Game, and Entertainment industry folks heading out to NYTF next week. If you get a chance, please swing by our super secret set up and check out some of our upcoming releases, prototypes and get a chance to chat about some possible collaborations. You also get a rare opportunity to see our friend Louie Gasparro create magic on our AllCityStyle trains, see some custom painted Maddies and other goodies from The Four Horsies of the 'Pocalypse project. Contact Klim Kozinevich if you want to make an appointment or just say hi as you pass through. Oh, and if you say "Voldermort sent me to talk about the 'Pocalypse" you can get some free swag (while supplies last)! The awesome 6" Little Maddie figures created and produced by Bigshot Toyworks (via a Kickstarter that I managed) are now in stock and available for purchase at BigshotToyshop.com! Original painted colorway (purply-black) and the Spirit World clear colorway both available at $55 each. Only 200 made in the clear color. Limited availability of each. These are now showing up at the doorsteps of the backers to rave reviews, with many people commenting on the high quality and awesome paint. Click here to visit the Four Horsies section of the Bigshot Toyshop site. There's a Mondays are Maddness mug for sale as well! 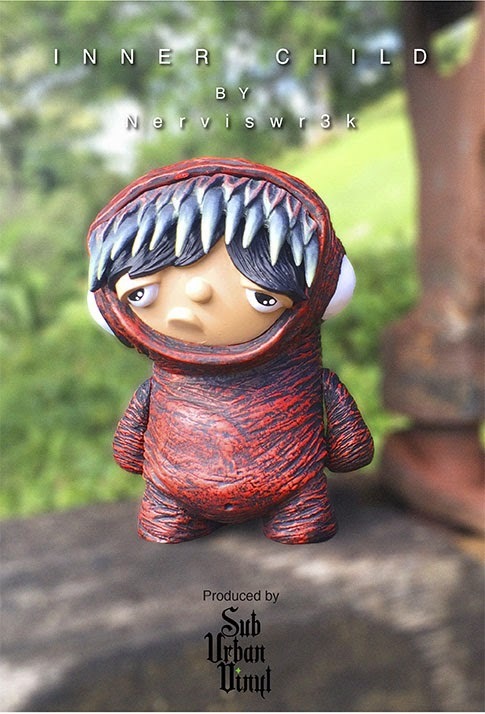 We are super excited to support our friend Nerviswrek in the release of his first production toy! Our buddies over in Jersey, SubUrban Vinyl, have produced this figure in a few different colorways. The first one you might have seen on this blog was our Tenacious Toys exclusive blue colorway. 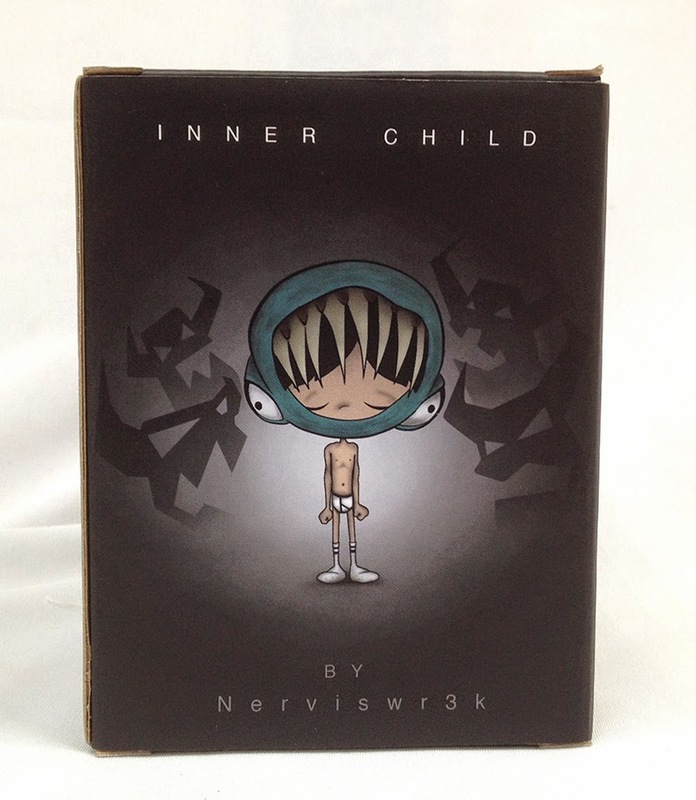 I'll be revealing more info soon about The Inner Child- they are already here in the US and a release schedule is being established. Each figure retails for $45. More info (like release dates) coming soon. Yes, we will be stocking some of the red colorway in addition to our blue ones, so you will be able to order both and save on shipping. We also got a sneak peek at the packaging, which I'm super stoked about it as it features an illustration by Nerviswrek's brother Brown Whale! Bigshot Toyworks and the Four Horsies of the Pocalypse have announced the next stretch goals for the Four Horsies Kickstarter: at $70K all backers at $100 or more get a FREE 4-button pack and a FREE sticker set! 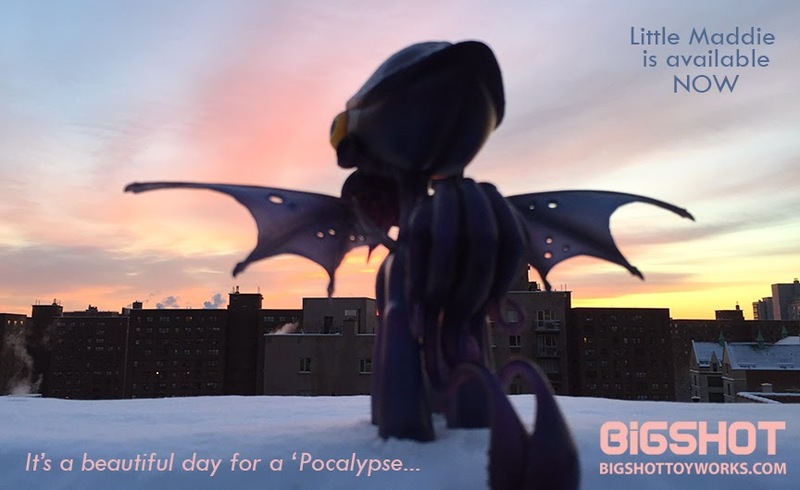 But the real reason for this post is the next four Stretch Goals: at $75K the first Kickstarter Exclusive Variant Four Horsies figure will be revealed and unlocked for purchase: Ghost! This KS Excl Ghost will feature a new accessory and a Kickstarter Exclusive color variation utilizing the classic Kickstarter green color. Once the Kickstarter hits $75K, backers at $100+ can add $20 to their pledges to receive one of these super limited Ghost variant figures. At $80K, $85K and $90K, there will be new reveals and unlocks of the rest of the figures: Clash, Calamity and Raven, respectively. Each of these KS Exclusive variant features an additional accessory or a variant head shape, PLUS a KS Exclusive colorway featuring the KS green color. Above graphic is a silhouette tease of all 4, they will be fully revealed one by one as the Kickstarter hits the various Stretch Goal marks. These Kickstarter Exclusive variant figures will only be made in a quantity big enough to satisfy the numbers that the Kickstarter backers generate with their pledge Add-Ons. That means these KS Excl variants will be the most limited variations of the Four Horsies figures... probably ever. No one outside the KS backers will be able to buy these. 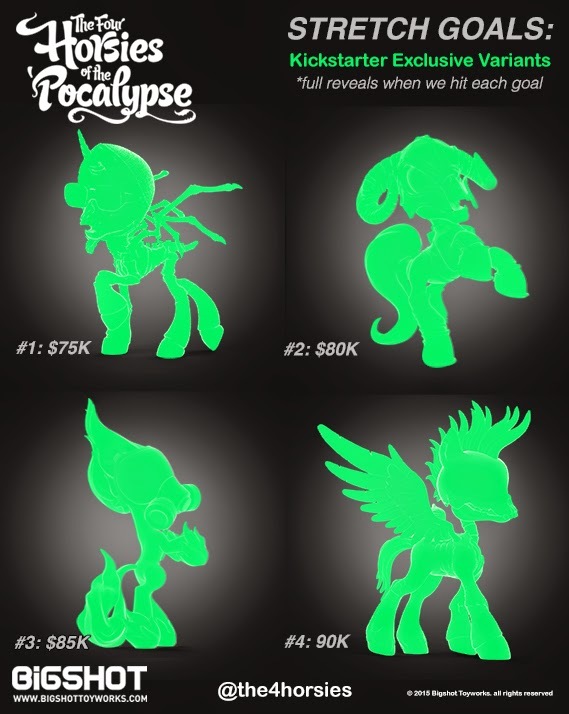 Click here to back the Four Horsies of the Pocalypse Kickstarter! "Coming a little later than planned, we can now finally reveal details of the “Marble Madness” Lucky Bags from the merry band of Disarticulators! As the name would suggest, each bag of keshi goodness is set to feature a number of one-off marbled figures spanning the past two and a half years of Disarticulator releases, including guaranteed large (Rotten Tomato) and medium (Leucotomy Ball) sized figures as well as 2 standard scale keshi (from a choice of the Atomic Uchuujin, Lobsterman or Critter)- each and every one hand sculpted by Zectron and produced in a glorious keshi-style rubber by Tru:Tek. The “Marble Madness” Lucky Bags - limited to an edition of just 8 - will be up for grabs at the bargain price of $100 each plus shipping- over 25% off individual retail! But that’s not all… On top of the bags, there will also be a number of other figures available on the drop, including a new one-off marbled run of SKC’s Screwballs! Based on an illustration for Strange Kids Club’s ongoing Circle Jerks sticker line, the stunning gross-out sculpt was originally undertaken by artist Jose David Cifuentes Ulloa as a fan project, quickly sparking the interest of SKC editor, Rondall Scott III, and ultimately leading to a full scale toy release. 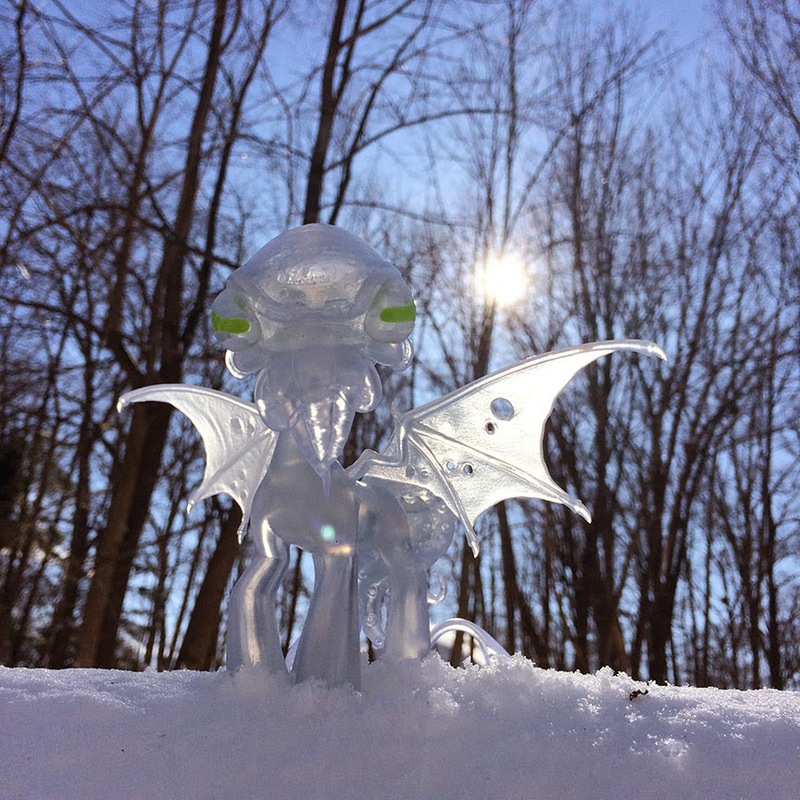 3D printed, prototyped and produced courtesy of Tru:Tek over at Disart ToyLabs, the 3″ x 2″ rubber figure has been cast in a variety of 2, 3 and 4 color marble mixes this time around. Limited to just 10 figures priced at $35 each plus shipping, the one-off marbled Screwballs will be joining the Lucky Bags – plus a few other goodies – in the Man-E-Toys store.